I guess that most personal web sites are a way for that individual or individuals to show off their achievements. I rather think that this one is no exception! However, as well as showing off, most sites also try to contain things that are informative or interesting. Again, I hope that this will prove to be the case here. The site is called "Faydon" because although most of the stuff here is written by me I would have got nowhere without the help and support of my wife. So what is here that might interest or inform? The following topics are those I intend to include. As they are written, links giving further information will be included. If you see any errors or additions or you would just like to chat, you can contact me on don at faydon dot com (written out to avoid auto spammers). To go to the different sections, click on one of the small pictures on the left. If more information is included, another link will appear. We have researched the remains of a number of old railways. Two of these appear below, click on the pictures to find out more. 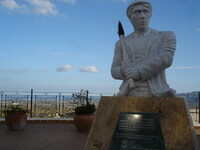 This went from the capital, Valletta to the old city of Rabat. It was about 7 miles (12 km) long and ran from 1883 to 1931. Surprisingly, after all this time, there are still many things to see. 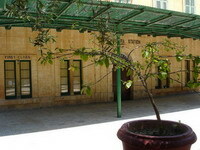 On the left is Birkirkara station which has had the facade restored to its original state. I have two pages, one on discovering the trackway of this railway by means of three short walks and the other on the Malta National Trust who have a number of restored and preserved artifacts of historical interest. The Great Southern of Spain Railway (The GSSR). I have written a book about this railway, situated mostly in the Spanish Province of Almería. It was built by a British Company in the 1880s but although the line survived for 100 years, British interest ceased with the seizing of the line in 1936 (The start of the Spanish Civil War). I have several pages describing the book and matters relating to it. 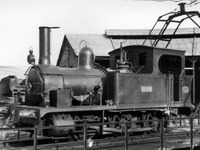 There are many pictures and newly discovered archives and biographies.The picture on the left shows one of the Mercer engines used in the line's construction (Photo by Lawrence Marshall). Here is a Map which shows the location of the sites described below. Click on the map to enlarge it. From pre-Roman times to the present day, Almería has been a rich source of minerals. However it was the hundred years between 1850 and 1950 that saw the largest exploitation of this natural wealth. Lead mining saw a brief expansion but it was iron ore that was to produce the real boom. Mining companies mushroomed everywhere. Unfortunately Spain was politically unstable and this, coupled with wars both internally and abroad combined to kill off most companies. Finally, by the 1960s, with seams running out, everything closed. Today, the only successful mining being carried out is for marble. Adra is a small coastal town right on the border with Granada Province. It has a very long history, going back to prehistoric times and there are a quite a lot of artifacts remaining. I started to write a page on Adra but unfortunately the web site that was my main source of information closed down. I have now bought two comprehensive books on Adra history and hope to complete the page soon. 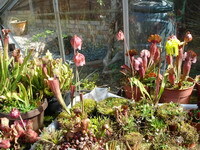 The pictures show; (Far left) Adra lead factory. Only the chimney now survives, near to the tourist office; (Centre) Adra Port Railway Although this short line was built in 1916 purely to construct the port,surprisingly, some artifacts still remain; (Near left) Adra Sugar Factory. 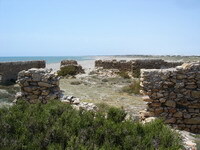 Although most of the salt factories in Almería have ceased or been built over, one still functions on the outskirts of the Cabo de Gata Natural Park. 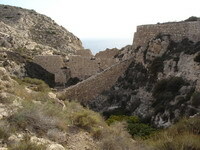 The picture shows the remains of a factory near Roquetas de Mar. 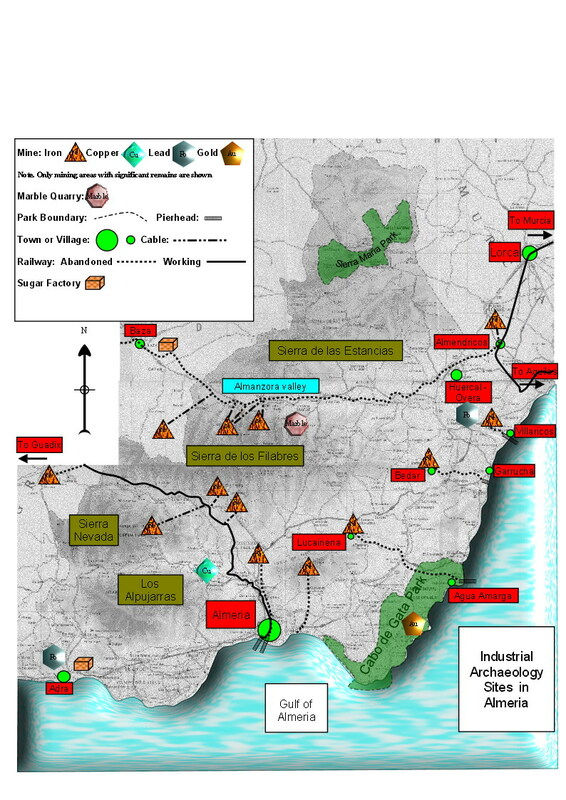 I have a page with a map showing where the major salt works in Almeria were situated. 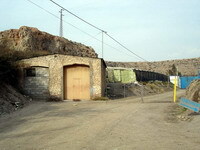 This link takes you to The Almeria to Linares Railway and its associated mines. 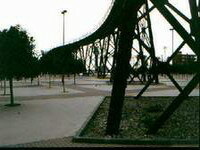 You can choose between the history of the line, The mines themselves, the loading pier (El Cable Ingles) and a description of the three phase engines that worked on the line. A small and largely unsuccessful attempt to mine iron ore in the Sierra Alhamilla a few miles north of Almería. Illustrated are the remains of the engine shed. There is nothing left of the line except at the mine end where there are some ruins and in the village of Pechina where the station building still remains intact. I tell the sad story of this line. 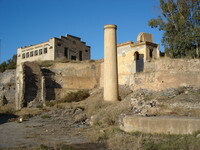 Although a bronze age settlement a few miles north ofAlmería Los Millares can still claim to be industrial archaeology since, as the picture shows, they smelted copper here. 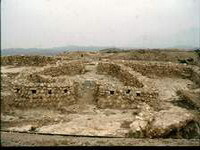 The site, to the north of Almeria, is large and well signed. 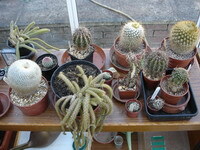 Opening times are Wednesday to Sunday 10am to 2pm. 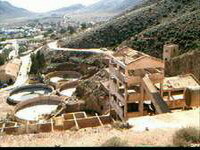 Situated in the heart of the Cabo de Gata Natural Park was a gold mine. Several attempts were made to make this a profitable one but with no great success. The site is clearly visible from Rodalquilar village and is free with open access. Nearby is the almost deserted settlement which housed the workers. This was a huge area for mining, initially for lead, then iron ore. The remains of many tunnels, hoppers and railway track beds still exist even though mining ceased 50 years ago.The picture shows a monument to the miners in Bedar Town. I have written a page on the main sights that can be visited. 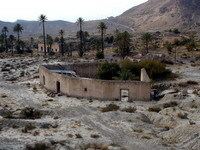 There are many artifacts left to see both at the Agua Amarga loading bay (pictured) and the mine works at Lucainena. Much of the old trackway is left and some of it has been turned into a footpath. I have written explanatory notes and diagrams to show how this mine operated. Mining has taken place in these mountains since prehistoric times, due to its proximity to the sea. The remains of lead and iron workings abound, although unfortunately, little is being done to preserve them. The Herrerias mines (pictured) had a connection with Louis Siret, who excavated the Los Millares site mentioned above. My Chosen sport has for many years been croquet. I have played internationally and represented England on a number of occasions. 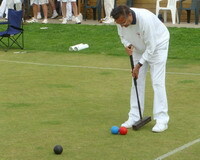 This link More on croquet will take you to the Bears web site. 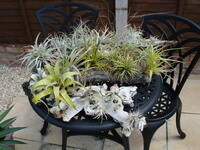 Faith and I collect Air Plants, Cacti and Insectivorous Plants. I intend to include more on these later.